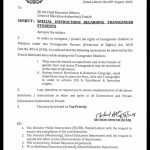 Govt of the Punjab Higher Education Department has issued Notification No. S.O. 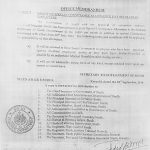 (A-II) 1-83/2012 dated 7th November 2013 in connection with the special facilities for disabled students studying in Educational Institution of Punjab. The Chief Minister has been pleased to approve the following for Special Students (Disabled). 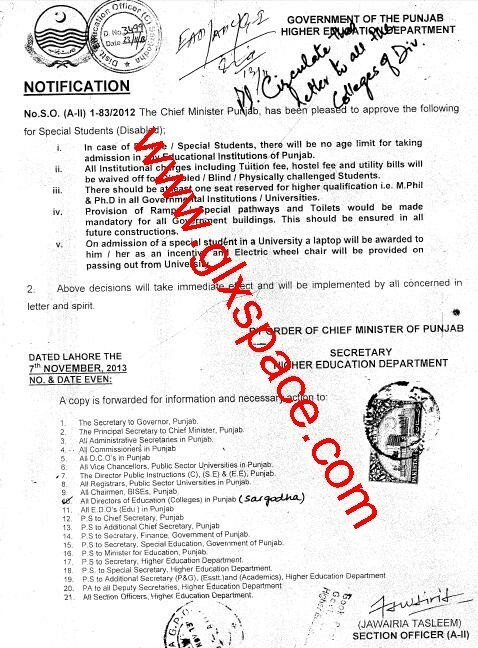 In case of Disable/Special Students, there will be no age limit for taking admission in any Educational Institutions of Punjab. All institutional charges including Tuition Fee, Hostel Fee and Utility Bills will be waived off for Disabled/Blind/Physically challenged students. There should be at least one seat reserved for higher qualification i.e M.Phil & Ph.D in all Govt institutions/universities. Provision of Ramps/Special Pathways and toilets would be made mandatory for all Govt buildings. This should be ensured in all future constructions. 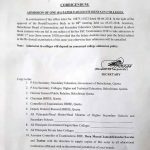 On admission of a special student in a university a laptop will be awarded to him/her as an incentive and Electric Wheel Chair be provided on passing out from University. This post h as been delivered by Mr. MUHAMMAD JUNAID, SENIOR CLERK GOVT. COLLEGE, ISAKHEL. 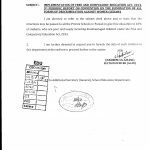 does the disables have exception from the fee of NTS tests????? Dear Shahid Imran, I have only this copy. 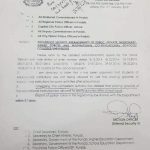 cm sab kiya yeh notifications sirf sarkaari dafatir ki almariyo k band kiwadon tk hi mehdood rahen gay.....................????? laptop jb dein gy jb hmein zaroort hi ni rahy g.....!!!! 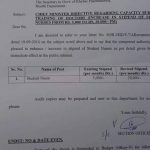 We need More Notification for Disabled Students / Employ in Punjab.